Pool coping is the rounded stone you see here. 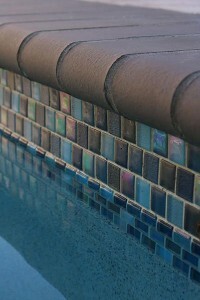 It helps integrate your pool deck with the pool wall. Pool coping plays an important role in the construction of your pool. It caps the pool shell wall and keeps water from getting behind the pool’s walls, but also gives swimmers something to pull on to get out of the pool, or to stand on before jumping in. Here are some common ways coping can begin to deteriorate over time, and why you should replace it. Since pool coping is usually what we tend to hang on when hanging out in the pool and grab when we need to make a quick exit, it’s not uncommon for it to start coming loose. This can pose a potential hazard since loose coping is on its way to becoming detached coping. Pool coping is essentially a piece of both your pool and your pool deck. People walk, sit and jump on it, and all that wear and tear can lead to cracked pool coping. Obviously, a piece of coping that has cracked will not keep water out, and can turn into a walking hazard. Sharp edges and bare feet are a bad combination, so replace cracked coping sooner rather than later. If the coping is crumbling, sooner or later it will need to be replaced. Concrete coping especially is prone to crumbling, since water can get into it and freeze. The ice inside of concrete can separate the stone from the binding agent used to hold everything together. This causes the coping to begin to crumble, and it will eventually fall apart completely. This entry was posted on Friday, October 28th, 2016 at 11:10 am. Both comments and pings are currently closed.